Labor has given the strongest indication yet that it won’t reverse the Coalition’s delays to increases in the Superannuation Guarantee rate. “Now what we would do is get to 12 [%] on the current, existing, legislated timetable. But we wouldn’t delay it as the Liberals seem to find an excuse to do at every opportunity,” he said. In March, Mr Bowen said that Labor would “brook no further delay to the legislated timetable” but did not set out an alternative timetable. 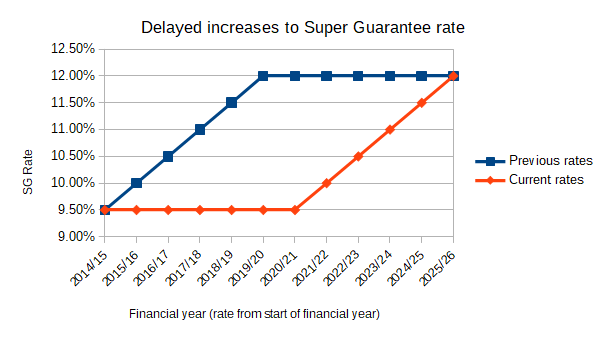 Under a timetable originally legislated by Labor, the Super Guarantee (SG) rate was going to reach 12% on 1 July 2019. However the Coalition delayed the increases, keeping the SG rate at 9.5% until 1 July 2021 and not reaching 12% until 1 July 2025. Labor has frequently been critical of the Coalition’s delays to increases in the SG rate, but has not set out a different policy. The Labor party platform doesn’t set out a timetable for increases to the SG rate, instead saying Labor will “urgently prioritise this objective by ending the freeze and increasing the Superannuation Guarantee to 12 per cent as soon as practicable”. Ahead of the 2019/20 Budget, a body representing superannuation funds called for the SG rate to be increased “as soon as possible”. The Productivity Commission, as part of its inquiry into the efficiency and competitiveness of the super system, recommended an “independent public inquiry into the role of compulsory superannuation in the broader retirement incomes system” before any increases to the SG rate.